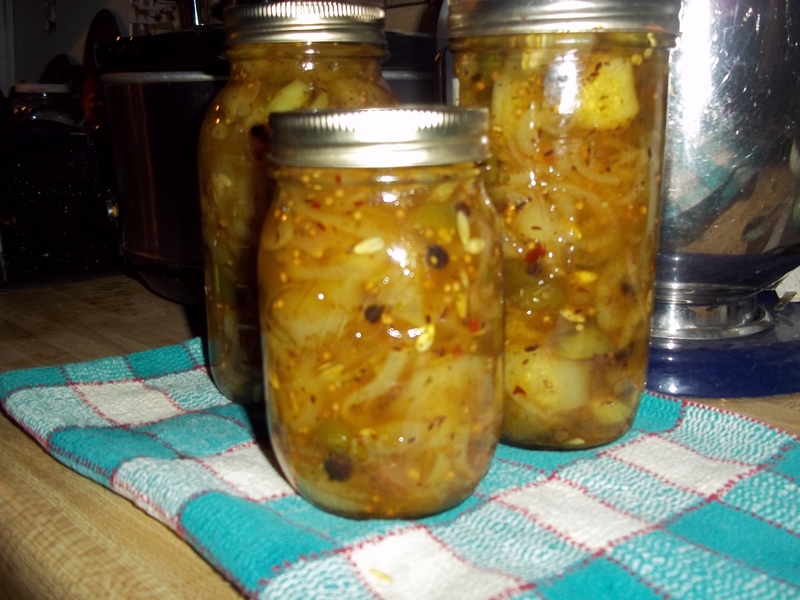 The pickles are done and the air in the house smells wonderful. Red peppers aren’t out in our area year and that would have added a bit of color. Slice cucumbers, onions, peppers thin. Sprinkle the salt on top and add enough cold water to cover vegetables. Let stand overnight. Drain thoroughly. Add vinegar, mixed spices, water, sugar and celery salt. Boil about 10 minutes. ADD CURRY POWDER JUST BEFORE BOILING TIME IS UP. Pack into sterilized jars and seal at once. I am back from the hooking event. A wonderful time was had by all. I worked on two projects while I was there and have included the pictures below. from of our home. Deanne asked what kinds of things did you do with your family. One of my favorite things we did was to go blueberry picking at my Uncle Homer’s farm in Chesterfield, Ma. There might have been 20 of us picking berries on a sunny July Sunday. My Grandfather, Aunts and Uncles and cousins and of course my parents and myself. We would tie buckets around our waists and off we would go. At noontime there would be a wonderful lunch spread on tablecloths laid on the ground. Off we would go again. 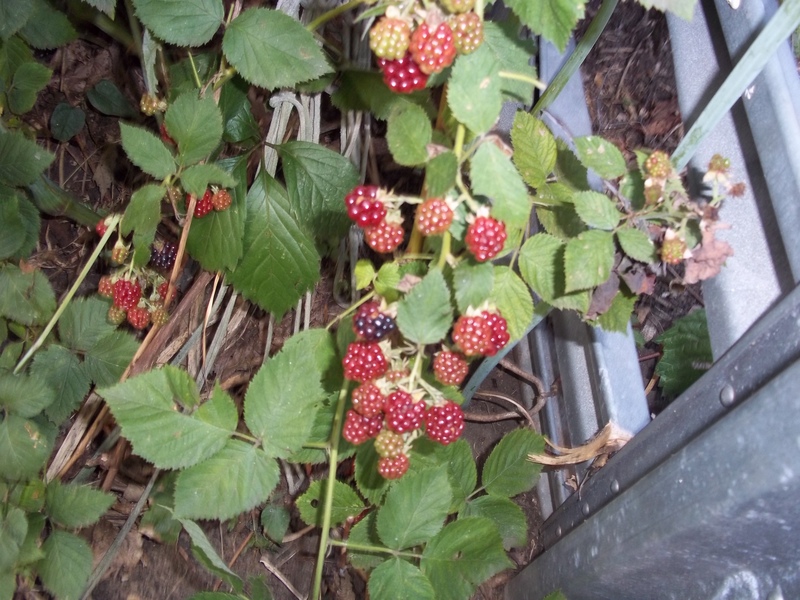 We brought the berries home and my Mom would go through them and pick out the twigs and leaves and then can them. They were put on shelves in the cellar till the winter winds blew and I would be sent down to the cellar where the wonderful blue jars would be sitting on the shelf and soon the smell of freshly baked blueberry pie would be floating through the air. So that’s how the Blueberry Jar rug came to be. By the way the caps are walmart bags!!!! I really couldn’t find anything else that would work. The lighthouse pattern came from Camp WOol over a year ago. 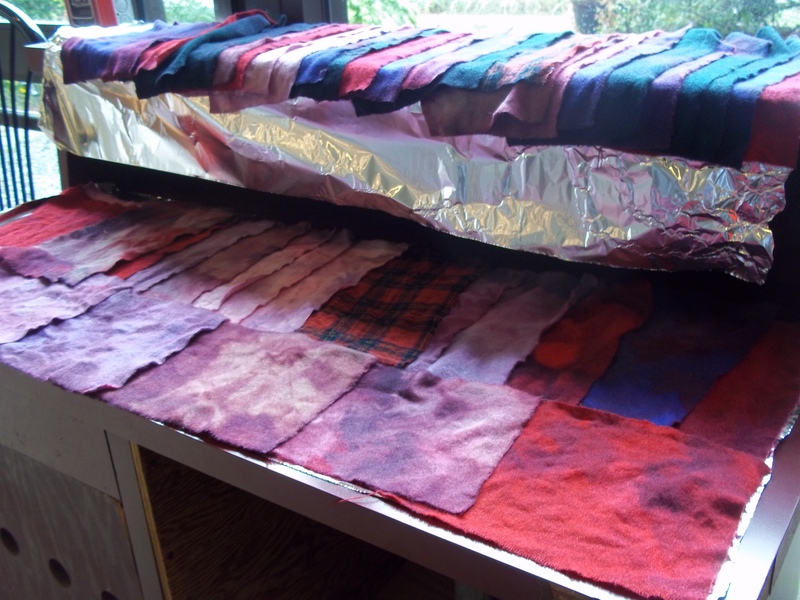 I am using handspun yarn, wool strips, roving and fleece. 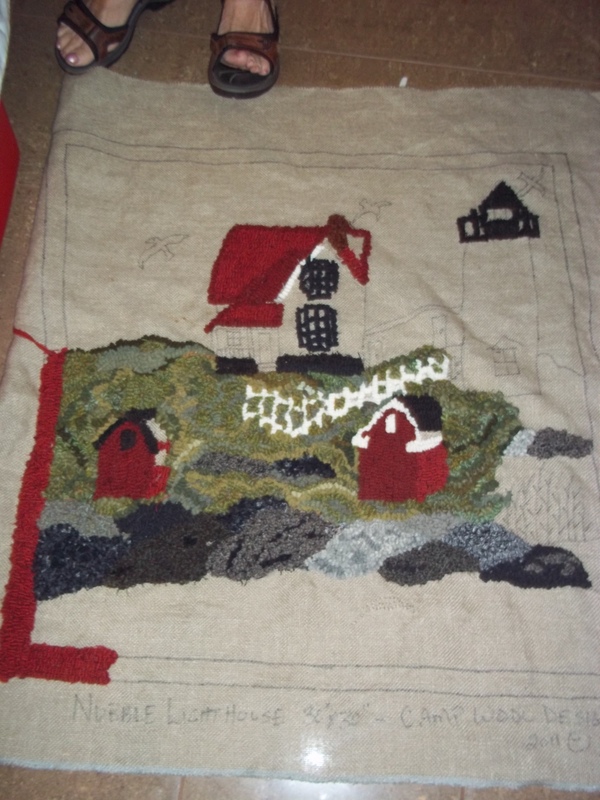 I am planning to do the ocean next and hope to get this done by fall. This rug will go to my oldest daughter Cindy. Nubble Light House is one of her favorite places. I plan to do a rug for my son David of his dog and cat and a rug for my youngest daughter, Elizabeth which will be of her horse. These things all take time but are so enjoyable. NO SHEARING TODAY. Marley, the little imp was wet so we hope to do it next weekend. If you ever get to Nova Scotia please stop in Deanne’s shop, its wonderful and inspiring. She also has a wonderful website and Blog. I hope to take another class from her soon. And Camp WOol is in Kennebunk, Maine. The store is full of woolen projects and a vacation destination. Every year in the spring she holds what is called Camp WOol. A retreat for hookers, it’s so much fun. More tomorrow about the hook-in. Today was a great day. There are tables at the hook-in where people can put out things for sale. I went over and found a beautiful oldish rug for $20. What a find. 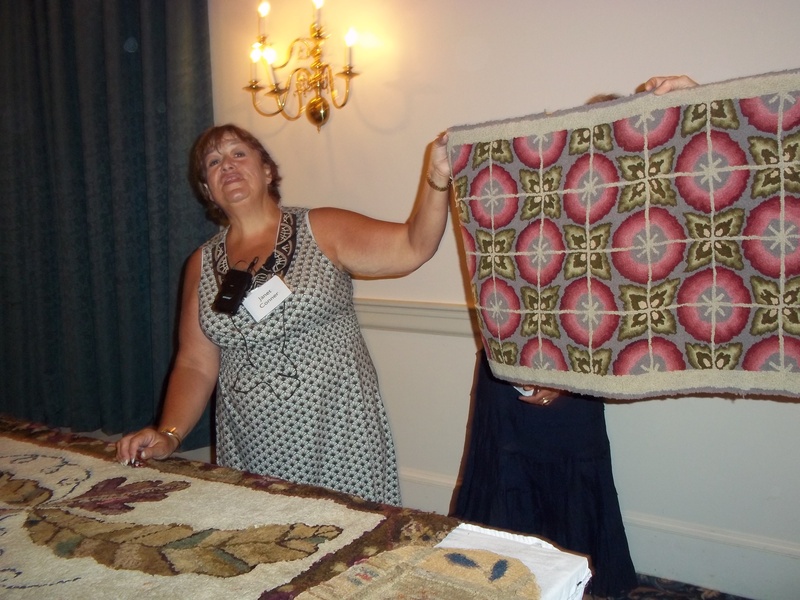 It just so happened that Janet Connor was giving a talk on antiques rugs , repairing them and their value. The rugs she showed were wonderful and her repairs were impeccable. 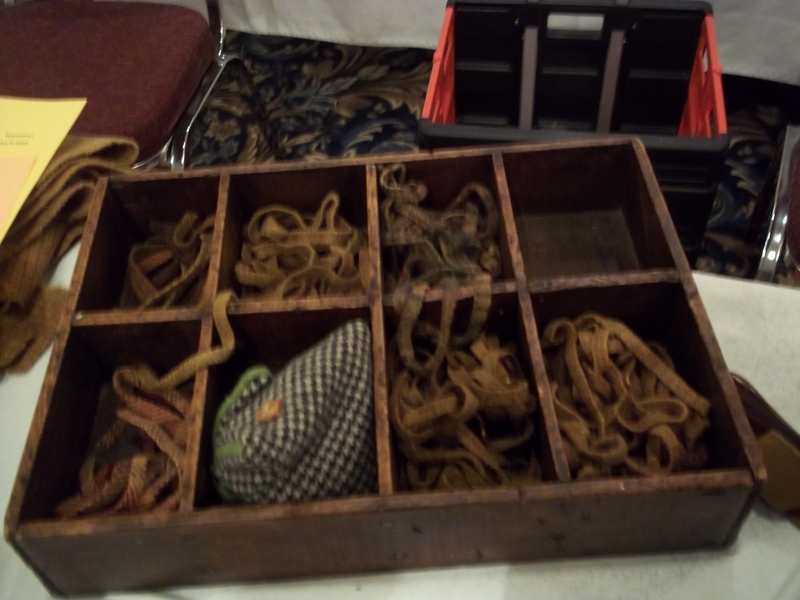 Some rugs were really old. The designs are still sought after today. SHe looked at the rug I bought and said that it was in good shape and need only minor repairs. She valued it at $150. My friend Debbie and I gave talks today. 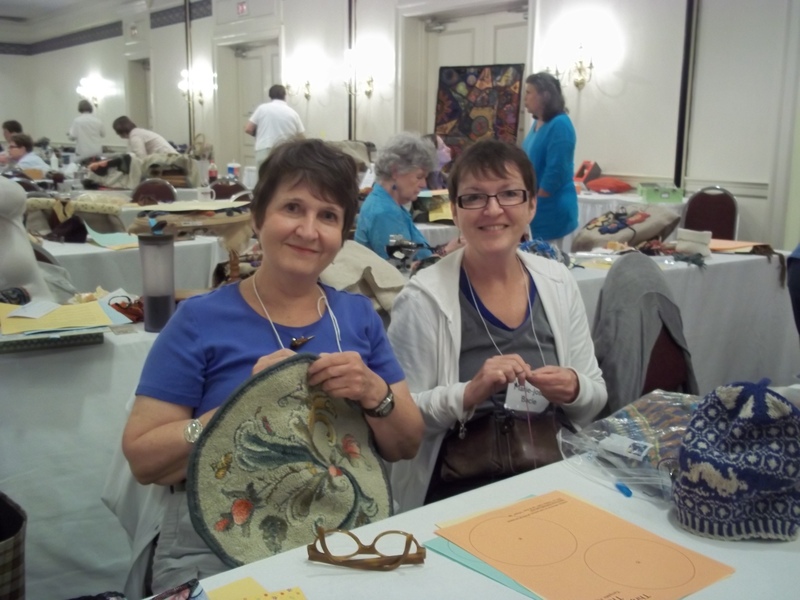 I gave one on hooking with fleece and roving and Deb gave one on punch hooking with rug yarn. They both went well. 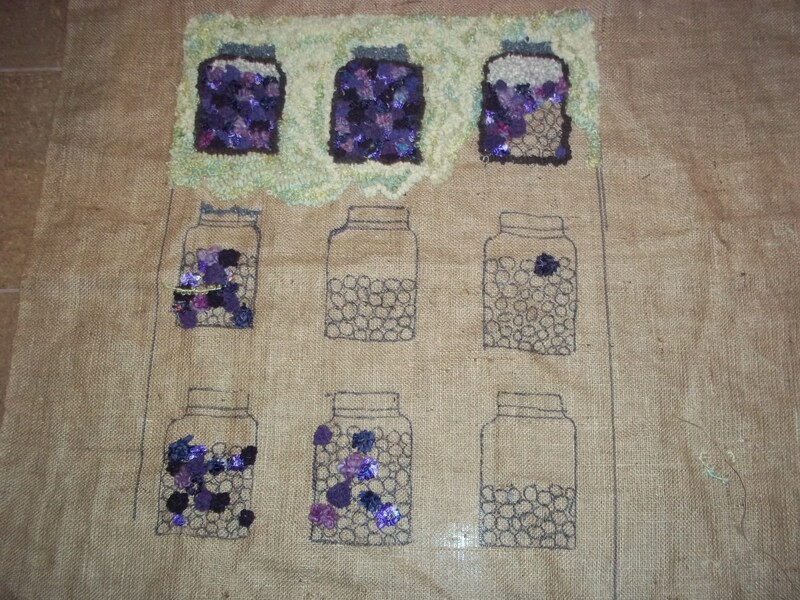 Today I have been working today on My blueberry jar rug which I started at Deanne Fitzpatrick’s workshop last October in Nova Scotia. I will include a picture tomorrow. 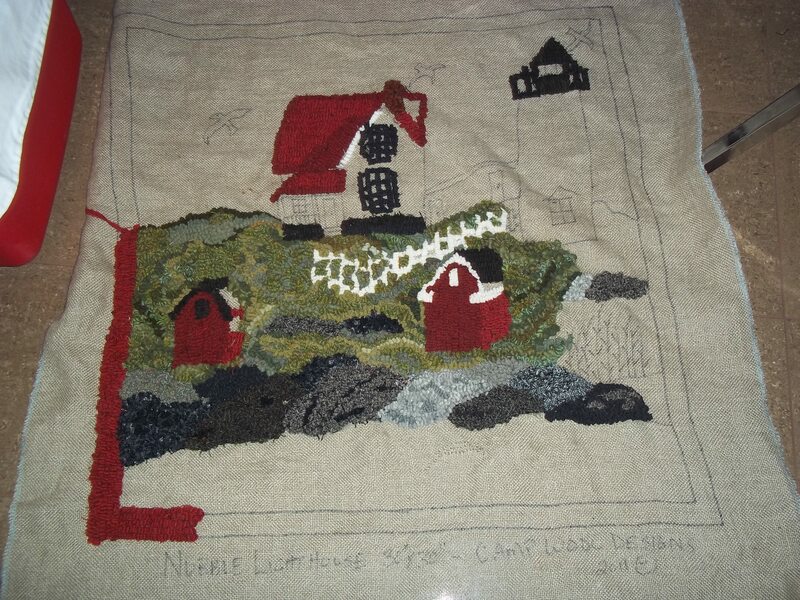 Tomorrow I will work on the Nubble Light House picture which got at last years Camp Wool. We had rain here all night but a home hardly had any. Off to get some blue wool for tomorrows project. I make this sauce all summer and freeze it. Sometime I cook it on the stove but the easier way is to do it is in the crock pot. You can make the sauce into spaghetti sauce or add it to stews or soups. I started with onions. peppers and garlic from the garden added some fresh basil and a leaf from the rosemary plant and a bay leaf from the small bay tree that I have. 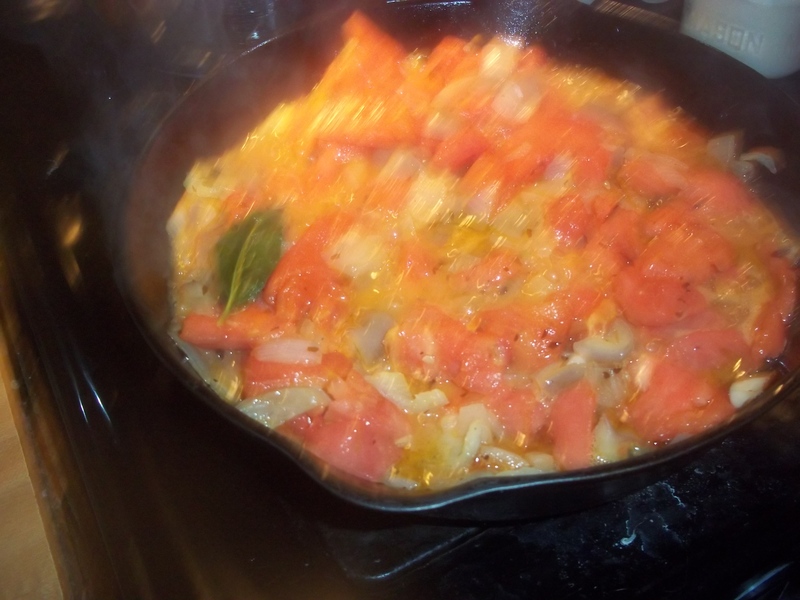 Simmer those and add the skinned tomatoes and cooked for about 10 minutes. Then into containers to enjoy when winter’s chill is in the air. 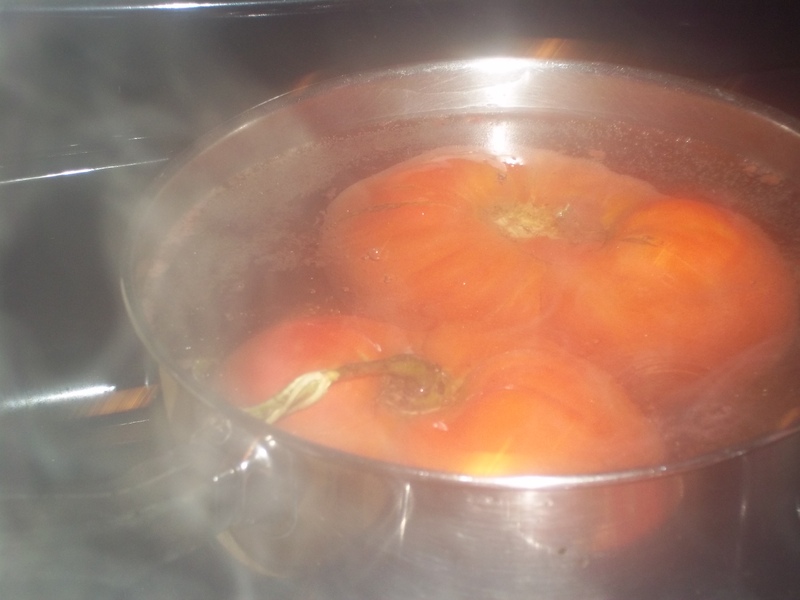 The tomatoes were at least 1/2 a pound each, I boiled them to release the skins The ride up to New Hampshire was wonderful. I was on Route 91 all the way and I have to say driving though Vermont is my favorite drive. The mountains covered with mist and deep valleys and covered bridges along side the highway who could ask for better scenery. Tomorrow I post pictures of the event. 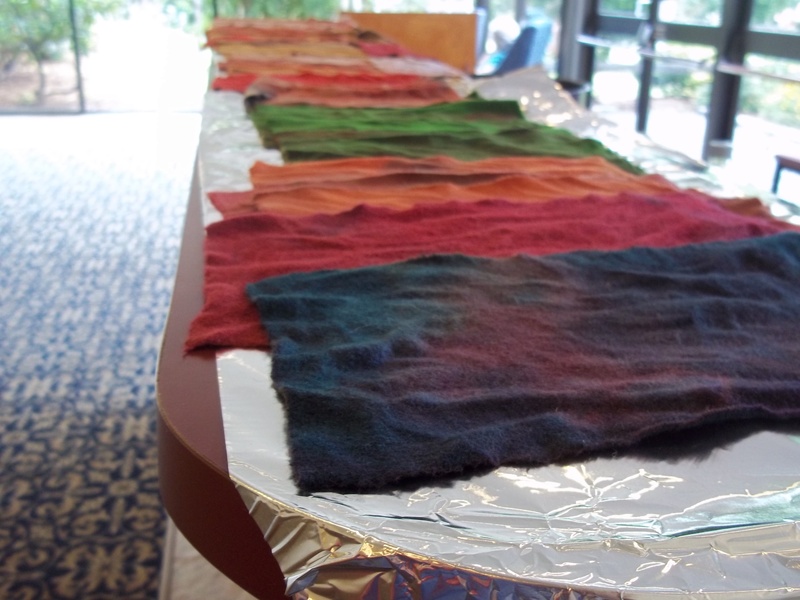 I am giving a demo on hooking with fleece, roving and yarn. I took this photo of Mrs. Brown last night. Occasionally she will sleep in the nest box. This is one of the new plastic nest boxes and it is high up. She feels safe and secure there. She is a Mile Flur banty. Very sweet and talkative. She lays a small egg almost every day. It was too hot to shear Marley last. night so we decided to do it Sunday Morning. Even though a storm and rain had come through the barn was still warm. 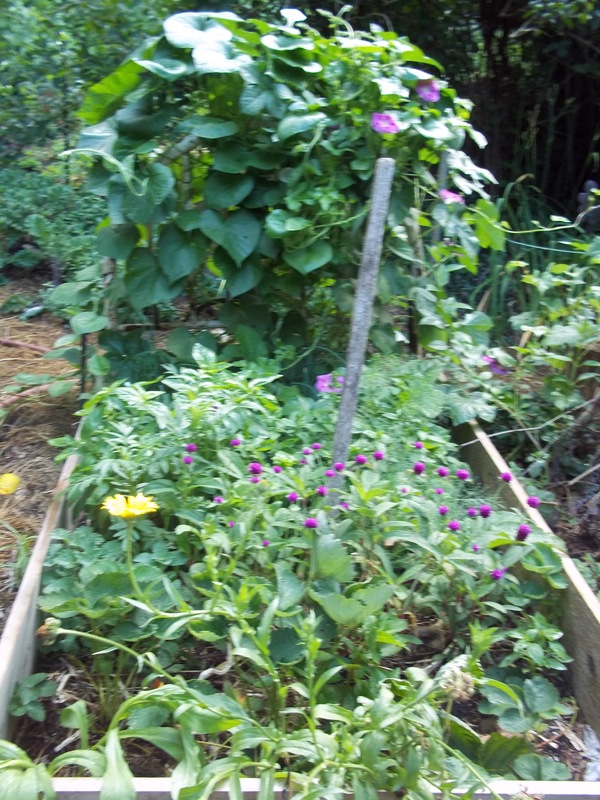 The Herb Bed is really going well. I will pick more basil todayand the globe need to be picked after they dry off some. 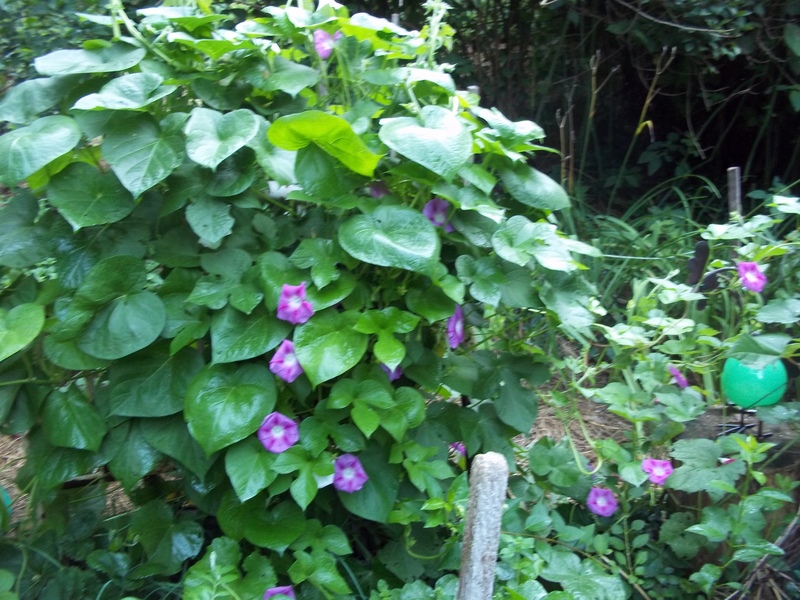 The morning glories are just beautiful with purple on one side and white on the other. 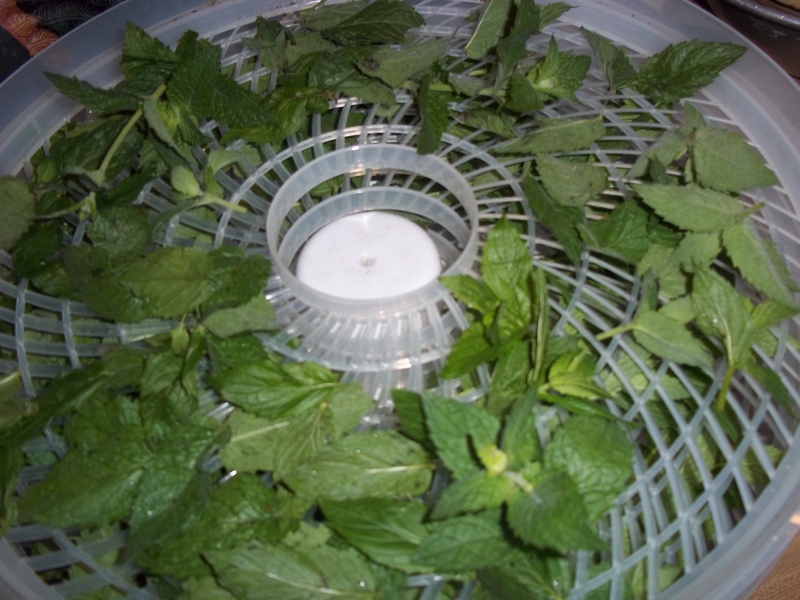 I picked spearmint this morning and put it in the dehydrator.It won’t take long to dry and I will be able to do a batch of basil and some catnip today. I bought this dehydrator last year. My old one still works but the plastic trays are mostly broke. I found that the new on dries herbs in half the time.I make tea with it.. Half will make plain spearmint tea and the other will me peppermint and spearmint combination. I buy the iron on tea bags on-line. Its easy just fill the bags and iron shut. These make nice gifts.Happy day to you. Today is a busy day. I must spread hay and manure around the lower garden this morning. 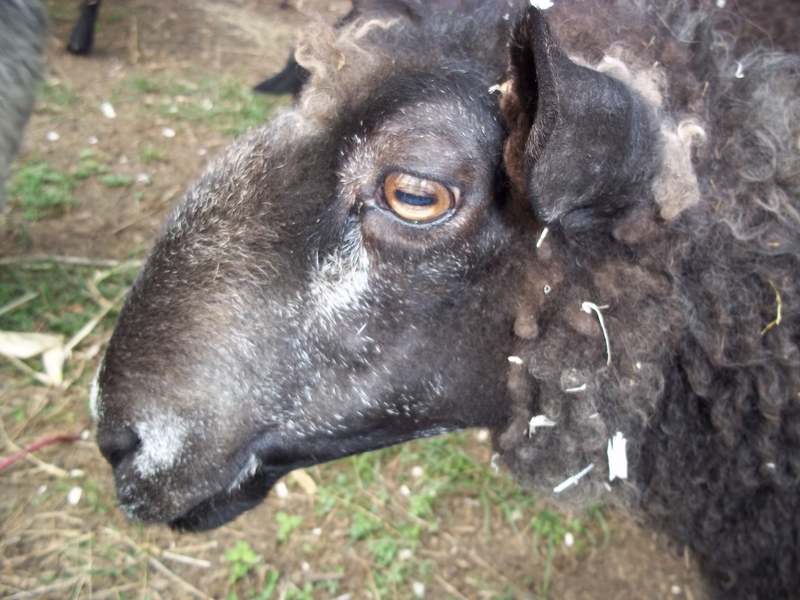 Tonight my Shearer, Steve Marcotte is coming over and shearing Marley. 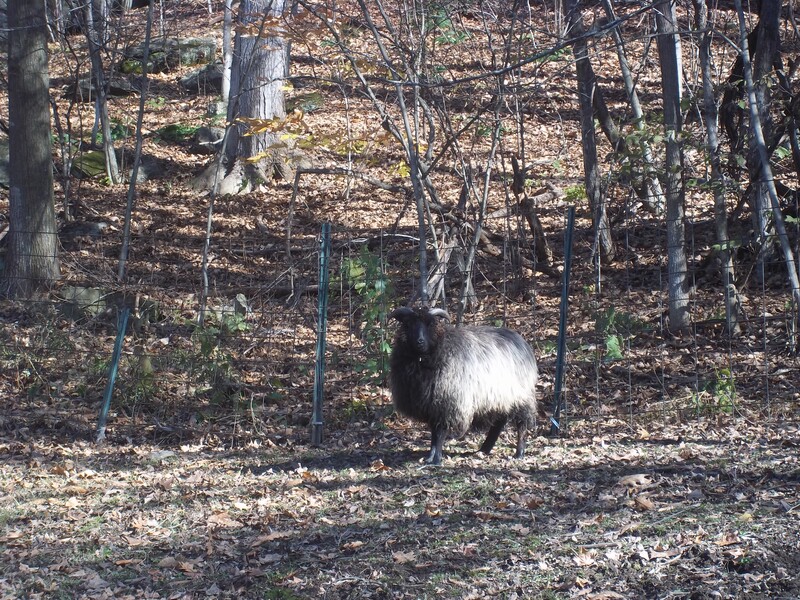 Marley is my rescue Shetland and I find that he is double coated and has grown 4 inches of wool since April. The poor boy is so hot so Steve will take the wool off and he has plenty of time to grow a good warm coat before Fall. I will include pictures in tomorrows blog. 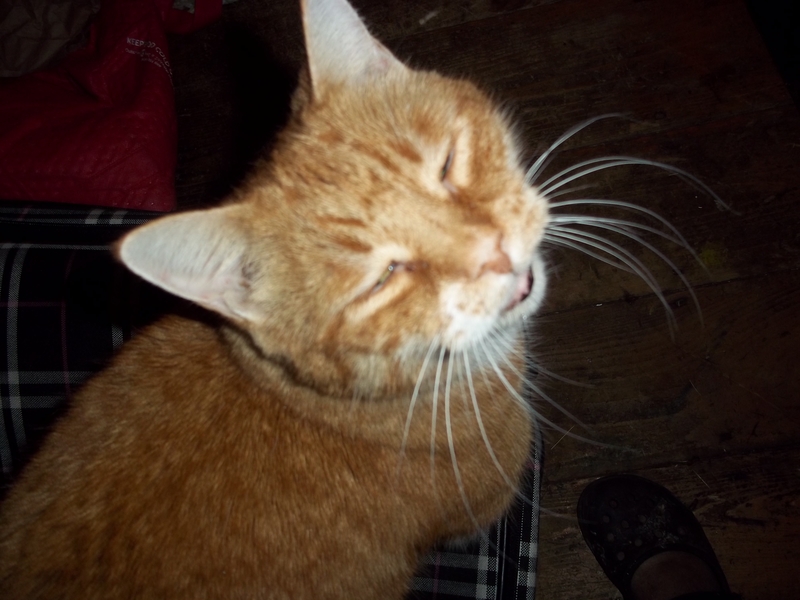 Marley came to me abandoned by his mother and raised by people. He was treated like a dog living by himself and being led around with a dog collar. His first experience with sheep are when he came to the farm. He was a feisty boy butting Elliott the llama running in-between his legs. That lasted 24 hours and was settle sometime during his second night at the farm. Marley now realizes that Elliott is in charge! The first 6 months that he was here he butted all the other sheep with his horns but now has settled in and rarely does that. He loves to be petted and will lay his head on your lap. He is a great addition to the farm. 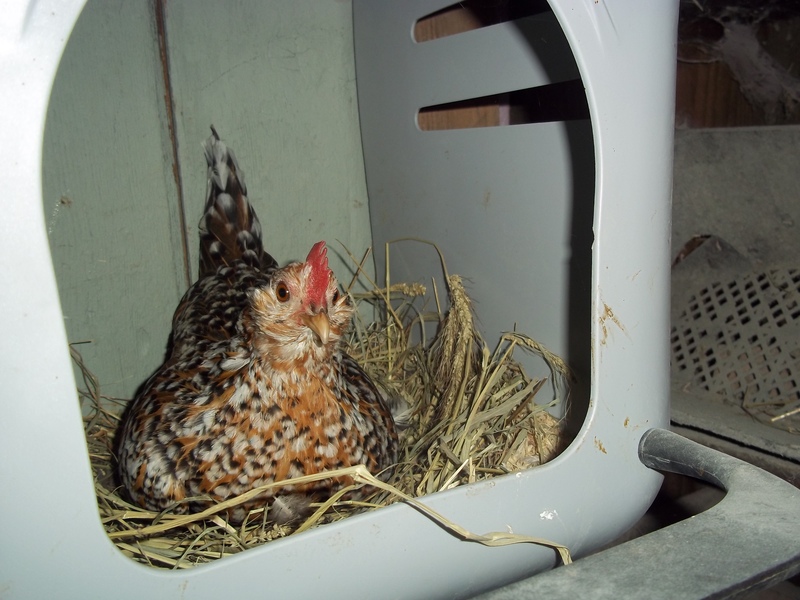 Hester again won the coveted nesting box position last night. Hester is a golden comet, not my favorite chickens as the ones I have had can be aggressive to the rest of the flock But I do love her. She came to me with part of her beak chopped off. 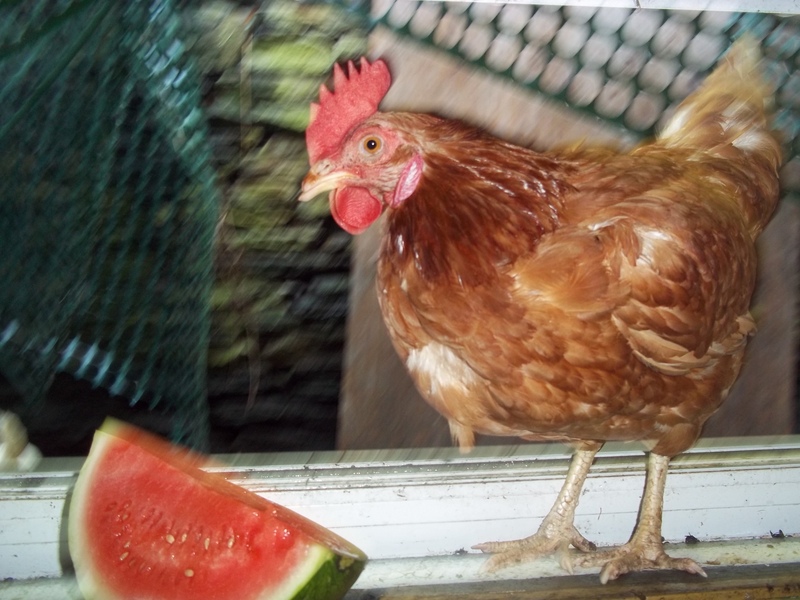 She has managed with this well, eats a little strangely She is the most loving hen I have. When picked up she will lay her head on you and talk and talk. She lays beautiful large eggs and is almost always the first one out the door in the morning. She has figured out a game plan for the nest box and usually get it. I think I will put a couple more nest box for the others to enjoy. 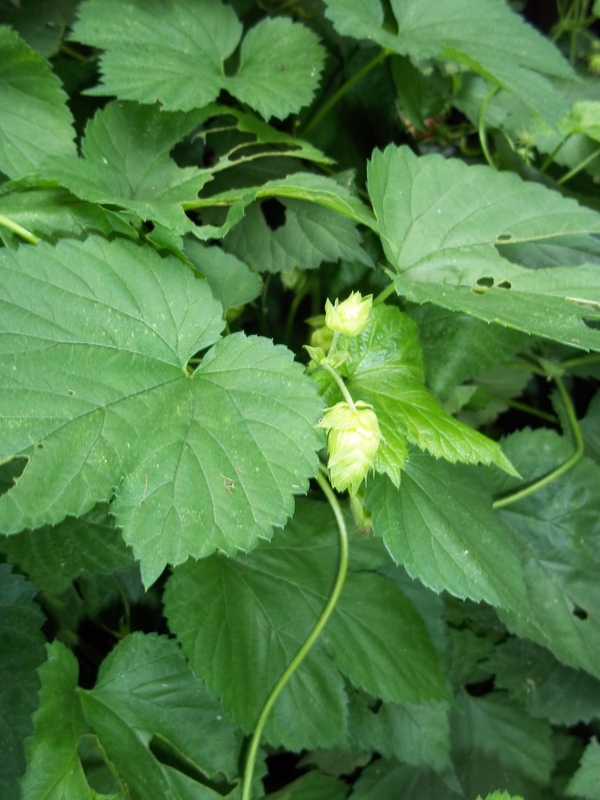 It won’t be long before the blackberries are ripe. I can’t wait to fill the freezer with them. Although that means that I will need to clean the freezer out!!!! This is Shorty greeting me when I got back from FLorida. He is the only cat that can open the door between the dining room and kitchen. He is sitting on my suitcase purring. It’s so nice to be welcomed home in this special way .